The Federal Government debt continues to increase. 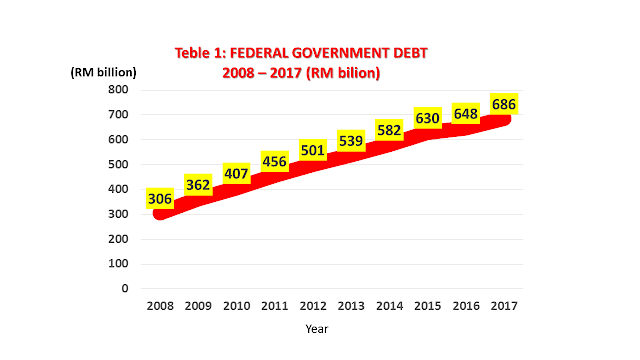 The debt as recorded in 2008 amounted to RM306 billion and the amount continues to increase by more than double to RM686 billion in 2017 (Source: Bank Negara Malaysia), see Table 1. 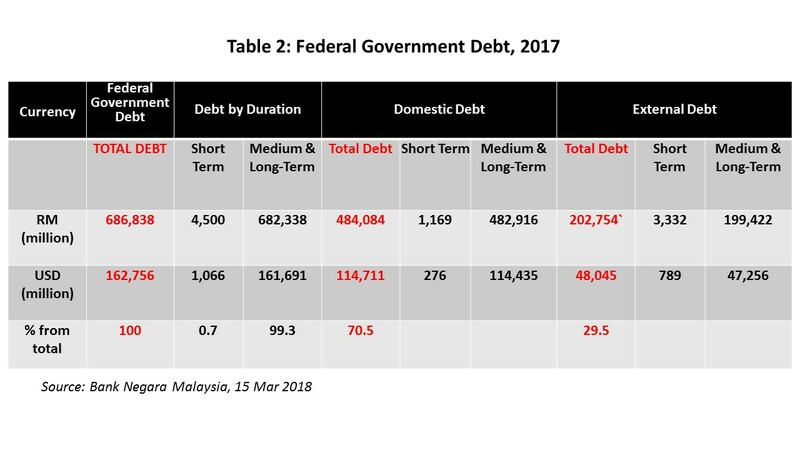 Of the total debts, RM484 billion (70.5%) is classified as domestic debt while the remaining RM202 billion (29.5%) as external debt (Bank Negara Malaysia, 15 Mar 2018). See Table 2. The Bank Negara also classifies Federal Government debt by short-term, medium-term and long-term debts. Short-term debt means debt to be paid within a year, while medium and long-term debt is payable for a duration of more than a year. Table 2 shows short-term external debt in 2017 amounted to RM3,332 million or RM3 billion, while the medium and long-term debt amounted to RM199 billion. Discussions on national debt, in particular short-term external debt (RM3 billion in the above example), normally relate the debt with the level of the Bank Negara International Reserve. What Does the Bank Negara Reserve Mean? Bank Negara Reserve or sometimes referred to as International Reserves is foreign currency reserves and other reservess in the form of assets held at Bank Negara. The reserves are kept in world's major currencies, such as USD, euro, pound sterling, yuan and yen. But in genaral, 65% of the total currencies are in USD because it is the major currency most frequently used in global transactions. 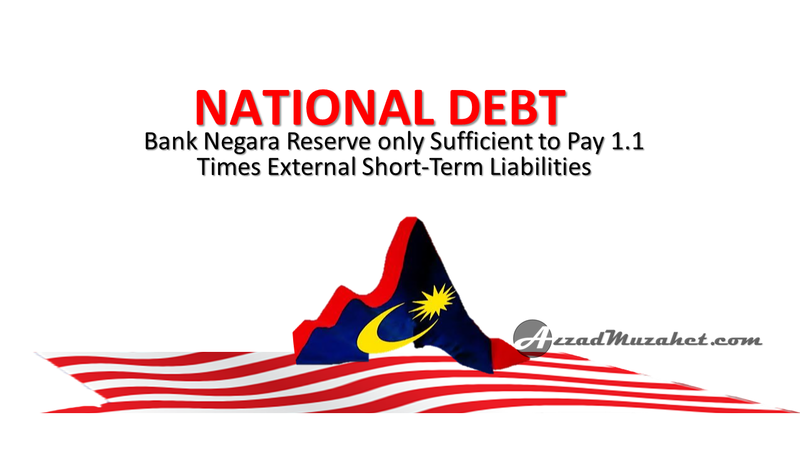 What is the relationship of Bank Negara Reserve with national debt? The Bank Negara reserves are used for repayment of liabilities involving foreign countries and external agencies. Among them are repayment of foreign debt and settlement of imports / exports from international trade transactions. Reserve is also required to buy ringgit currency in the international foreign exchange market (FOREX) to stabilize the exchange rate against other major currencies. This is done by Bank Negara if the value of ringgit depreciated significantly against the USD and other major currencies. For example, on January 13, 2017, Bank Negara made announcement to implement new measures to stabilize the value of RM after RM experienced the worst fall in value (RM4.47/USD) compared with other Asian currencies. Among the measures taken was the intervention by Bank Negara in FOREX i.e using the international reserves to buy the ringgit currency in the market with the aim of increasing demand for RM and thus stabilizing the value of RM in the currency market (New Straits Times, Friday 13 January 2017, 8.52 pm). If the Bank Negara Reserve is able to repay 1.1 times the short-term external debt, does it mean Malaysia is able to pay all amount of debt? Not necessary. Because the Bank Negara Reserve only takes into account the ability to repay the short-term external debt due within 1 year for the particular financial year (RM3 billion in 2017 in the above example). It does not take into account all national debt amounting to RM686 billion as of 2017. Some say that the country's reserves are now stronger and more capable to pay the short-term external debt than it was during the 1997/98 Asian Financial Crisis. Is this statement true? Not true. 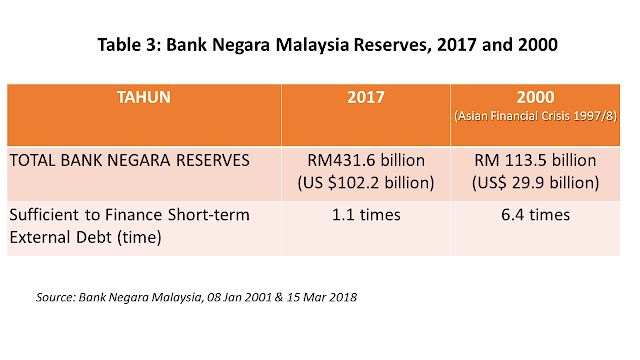 Although the current size of Bank Negara reserves is now bigger, at US$102 billion but that amount is only enough to repay short-term external debt by 1.1 times. On the other hand, despite the size of reserves in 2000 (during the Asian Financial Crisis) smaller, at US$30 billion but the amount was enough to pay 6.4 times the short-term external debt (see Table 3). What can be shown from the above comparison? There are 2 things. Firstly, the comparison shows that the current external debt is very much bigger than the amount during the 1997/98 Asian Financial Crisis. 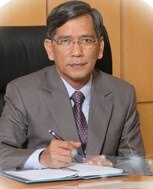 Secondly, as mentioned above, the Bank Negara reserves are not only needed to repay the short-term external debt for the particular year. If all reserves are used to pay off the short-term external debt for the year (1.1 times), Bank Negara does not have enough reserves to pay for other liabilities, such as the settlement of imports / exports from international trade transactions and intervention in FOREX when it is necessary. On the other hand, during the 1997/98 Asian Financial Crisis, if reserves were used to pay 1.1 times the short-term external debt for the year, Bank Negara still had enough reserves (5.3 times) to pay for other liabilities. Some say our country’s debt is under control and not as bad as it is compared with other countries, such as Singapore which has higher debt obligations as a percentage to GDP. Is this statement true? It is true that the national debt as percentage to GDP for Singapore for the period 1993-2015 was high. For example, in 2015 the percentage was 104.7% while Malaysia was only 54.0% (Source: Tradingeconomics). However, we shouldn’t assess the debt of a country only in terms of liability. On the contrary, we need to distinguish between two countries that have the same amount of debt but have different amounts of assets. In the case of Singapore, the country does not borrow to finance operating expenses, such as salaries, allowances, repairs, supplies of materials, interest rate payments, subsidies, BRIM, and other various cash gifts to the people. On the other hand, loans are used for investment, i.e loans are backed up for assets. Thus, it is true Singapore has higher debt as percentage to GDP. But the country has a stable balance sheet where assets value exceeds the liabilities. Return on investment from assets is more than enough to pay off debt in that country. But why do some people argue otherwise? It may only be for the purpose of sweet talk without references to facts and reality. The current national debt is high, amounting to RM686 billion. Debt is no problem if it is for the purpose of investment and to finance economic development programs because debt of this kind has a positive 'chain effect'. But if the debt is used for other purposes than investment, it can bring negative effect for the future economic development and growth of the country. Author: Dr Muzahet Masruri. Ph. D (Economics), University of East Anglia, United Kingdom.